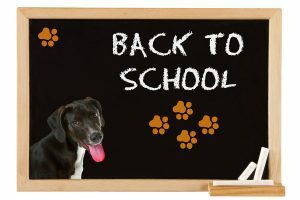 This week the team at PetCure Oncology highlights ways to help ease your pet’s back to school blues. Find ways to relieve boredom, prevent separation anxiety, maintain a good exercise program despite a busy schedule and keep your dog engaged with puzzle toys. – After a summer of relaxing and hanging out with the family, what can you do to help your pet adjust to the new back to school routine? WZZM channel 13 offers some ideas for relieving boredom in Pet Peeves: Back to School Blues. – When schedules change and the kids go back to school, separation anxiety can be a common problem for pets. In Help Pets Beat the Back to School Blues, Petplan pet insurance and KEYC channel 12 share strategies for refocusing your pets and relieving their anxiety. – Heading back to school doesn’t have to mean less exercise for your pets or your children. Starting a new exercise routine is a great way for your kids and pets to bond while keeping healthy and active. Pet Talk: A Back-to-School Exercise Routine Will Keep Kids and Pets Healthier from Oregon Live provides a list of exercise ideas from simple and easy things that can be done anywhere at anytime to structured activities like agility training. – Pet360 shares ideas for helping your pets adjust to the schedule change in the slideshow Back To School for Pets. They cover everything from treats to socialization needs to puzzle toys. They even suggest some additional training that involves your kids.